This sheepdog is bonkers, you can see it in his face and his owner confirms it. 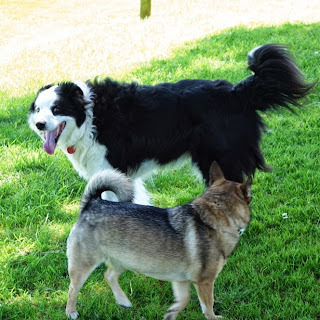 Bonnie meets him in the park and they play together but he takes off from time to time to try to catch sparrows high up on the tree and barks and jumps at them. Bonnie just looks at him, like, are you OK dude? – I like catching birds too but I am not that ambitious as you are.